It is with pleasure that we announce a new PlayerUnkown’s Battlegrounds player joins the team: Claudio “Barloss” Nicitra. Close to our other player EvoliumAlex, we believe he will blend in with the team without issues. Barloss will replace Grégory “Falcuma” Ollivier, who had joined us a short time ago. 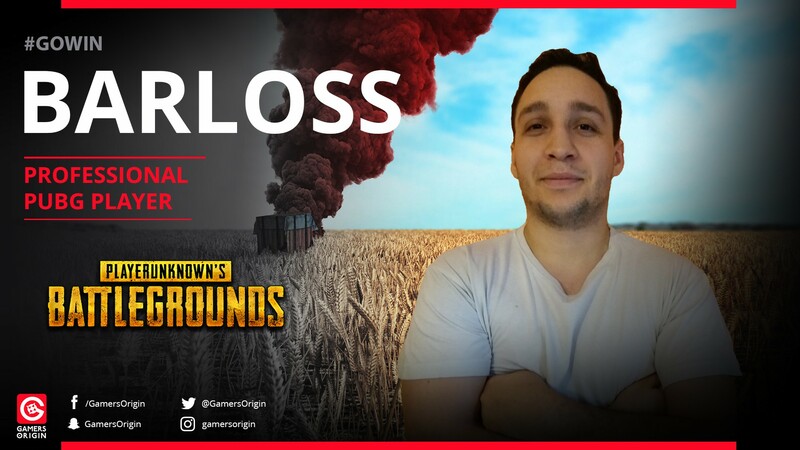 GamersOrigin thank him for his involvement in our PUBG adventure and for leading our team, especially during the Gamers Assembly, where we managed to get to the top 8. With several top 1 at the X-PulZ Francophonia, Barloss joins us with a good experience of the game. He may be a precious asset thanks to his great knowledge of PUBG, which he has been playing since it was published, as well as his time in the competitive scene: having played with teams such as Venture, he is already familiar with competitions and teamwork. In my everyday life, I am an FPS enthusiast, but I also have other leisures such as sports, gastronomy and hard science. I started playing FPS on PC as PUBG’s beta was launched, and I got really hooked on it. After many hours on the game, I decided to launch myself into competitions, and I had the chance to meet EvoliumAlex with whom I’ll now play for GO! You will be seeing the belgian player sport GamersOrigin’s colors for the first time during the Geek Days in Lille, on the 26th and 27th of may, where our team was invited by the organisation. A victory in this tournament would allow us to position ourselves in the french top of PlayerUnknown’s Battlegrounds. We thank our sponsor Nahimic, that supports the PUBG players during all of their competitions. Good luck to our team and to Barloss for the Geek Days, #GOWIN!